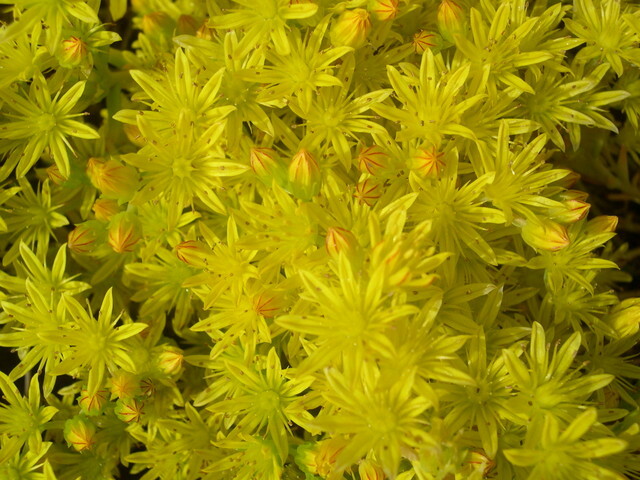 The species S. amplexicaule is very unique in the world of sedums. As a way to protect itself from the dehydrating forces of summer, it goes into dormancy. All of the leaves fall off as it comes into bloom June - July (This photo), leaving dry stems with little dry 'propagules' at the ends. These propagules can fall off and be moved by wind. At the end of September the propagules begin to grow. In the fall the plants spring back to life with attractive fine textured blue-green foliage that keeps looking nice until bloom time in summer. Flowers are yellow. This is a miniature form of amplexicaule with very short stolons. An alpine from Portugal and Spain. Now that I understand how this plant acts, I like it a lot.